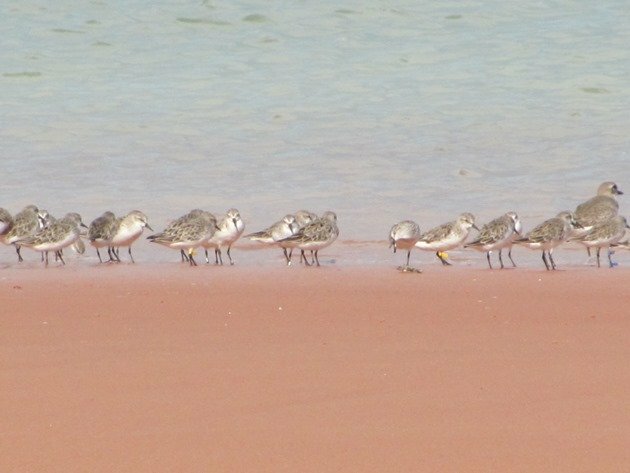 At this time of year in Broome there are thousands of migratory shorebirds along the shores of Roebuck Bay and in the township itself and along Cable Beach. They have been here for several months and are currently changing into their breeding plumage and fattening up. It won’t be long and we will watch them fly off into the sunset as they make their journey north to breed. Many of these migratory shorebirds will be heading into the Arctic to breed and some will make a stopover in Asia on their way to their breeding grounds. The majority of the individually marked birds in Broome are birds that have been marked locally with either a plain yellow flag, an engraved yellow flag or colour bands and a flag. With a plain flag you do not know the individual unless you capture it again and read the small metal band. The majority of the Chinese individually marked birds we observe only carry a black and white flag or blue and yellow flag, so they can only be determined to have been banded in China and not “known individuals”. 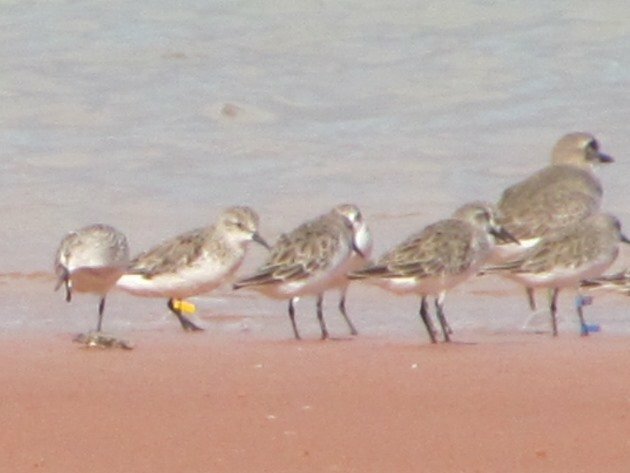 I have a regular visitor from Hong Kong and this particular Curlew Sandpiper first came to Broome wearing its white and yellow engraved flags “T8” in November 2012 having been banded as an adult in April 2012. It changes into its breeding plumage and heads off, but has never been seen back in Hong Kong! It has about 25% of its breeding plumage now and will soon head off once again and we will eagerly await its return later this year. I also have a Grey-tailed Tattler that visits us and was marked with a plain white and an engraved blue flag “35” in Taiwan in August 2012. I first observed it on 28th November 2012 and it left us and headed north to return to the exact same place to be observed on 19th November 2013. It also has started to get breeding plumage and will head off over the next few weeks. 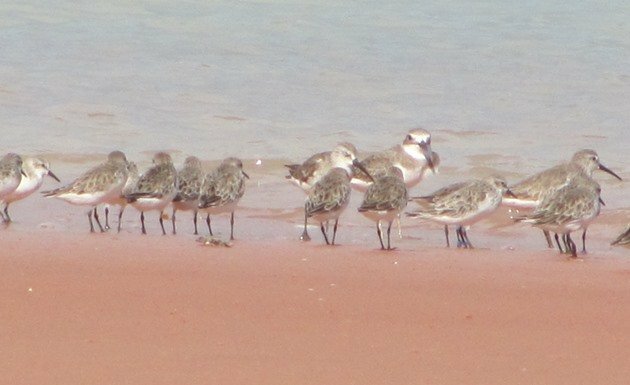 I spend a lot of time walking the beach from the township of Broome to the port of Broome at this time of year and I have the beach to myself along with thousands of shorebirds. They are very relaxed after high tide and that is when I make the majority of my observations. There are many site faithful birds, but also shorebirds that pass through the area before they head off to the north again. The majority of the smaller shorebirds use Cable Beach on higher tides, so the main species that I observe are Eastern Curlew, Whimbrel, Bar-tailed Godwit, Great Knot, Red Knot, Curlew Sandpiper, Terek Sandpiper, Grey-tailed Tattler, Ruddy Turnstone and Common Greenshank. There are smaller numbers of Greater Sand Plover, Lesser Sand Plover and Red-necked Stint. On Thursday 6th March there was a lot of shorebird disturbance due to the presence of Black Kites, Whistling Kites and a Brown Goshawk, which had taken a Great Knot earlier in the week. During a “panic flight” event it is not uncommon to see shorebirds fall into the sea and it is probably as a result of clipping each other’s wings as they are stood so close together when they take off. They either swim in to shore or lift off out of the water. At one point I was left with a very small flock of shorebirds which consisted of Red-necked Stint, Greater Sand Plovers and Curlew Sandpipers. 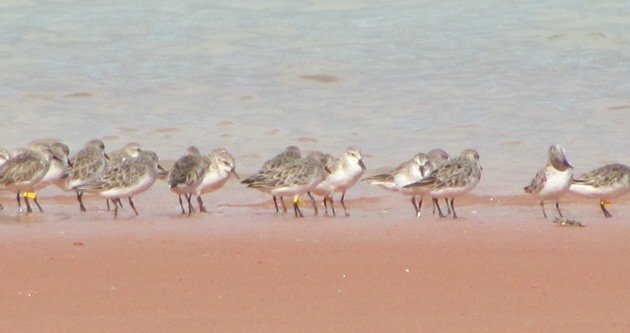 I checked for any individually marked birds and our locally marked Red-necked Stint only carry plain yellow flags. I have observed Red-necked Stint with an orange flag from Victoria and also blue and yellow flags from Bohai Bay in China, but suddenly I saw two blue flags. I immediately noticed that the upper blue flag was engraved with “321” and this would mean that the individual bird could be identified by the banding authority. I was in a bit of a panic with the nervousness of the shorebirds and I grabbed my little compact camera in the hope of getting some sort of photographic evidence. I lined up the telescope so that it was facing directly at the bird I wanted to photograph and thankfully had a much larger Greater Sand Plover to use as a target. I sat the little camera on top of the telescope and took a few photographs as quick as I could before they took off again. Thankfully I did get some evidence, which does not enable you to read the white writing on the little blue flag, but it is the smallest shorebird we have in Broome on our local beaches and I was more than happy to have any photographic evidence. As a result of the “Shorebird Colour flagging protocol on the East Asian-Australasian Flyway” I knew that this little shorebird weighing no more than 30 grams had been flagged in Northern Japan. I also knew that it was Lake Komuke in Northern Hokkaido. The information was sent off to Japan to enable them to let me know exactly when this little shorebird got its metal band and blue flags. The shortest possible route from Lake Komuke to Broome is over 7200kms and no doubt it did not take the shortest route! It probably spends quite a lot of time in Broome flying around with the various disturbance and has more than likely been roosting on Cable Beach for a few months with the other hundreds of Red-necked Stint. I knew very little of Lake Komuke and so while I waited for a reply from Japan I did some research into the area and it is an important area for a variety of birds. Over 200 species of birds visit the area and there are some excellent birding opportunities in the area. Hokkaido is a “birdwatchers paradise” according to the Japan National Tourism website! We all knew that, though, as we all saw the excellent blog by Ian Davies recently right here. Thanks to the wonders of the internet I had the banding information on this tiniest shorebird within 24 hours of the observation! It was a juvenile bird when it was banded on 2nd September 2013. It has travelled a long way since then and I hope to observe it each year for years to come and any of its friends as well! 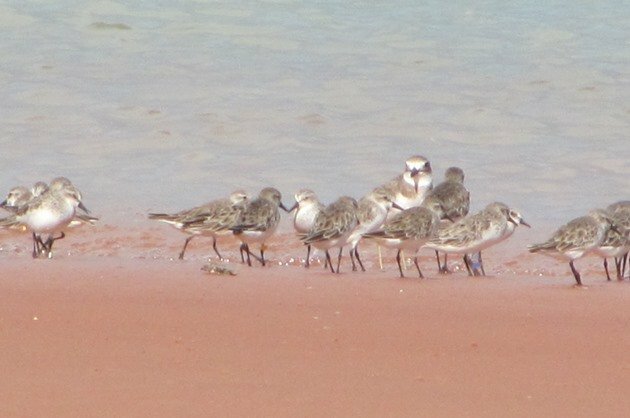 UPDATE:- This little bird was observed back in Roebuck Bay, Broome on October 21st 2014! UPDATE:- This bird was observed back in its original place on the beach near the port again on 29th December 2015! I almost felt like I was with you, Claire, watching those shorebirds. How exciting, to find one flying the Japanese flag! I love the fact that you can recognize birds that return year after year, evidence of structure and organization in what often seems like a chaotic shorebird world. Where Are You Birding This Second Weekend of March 2014?